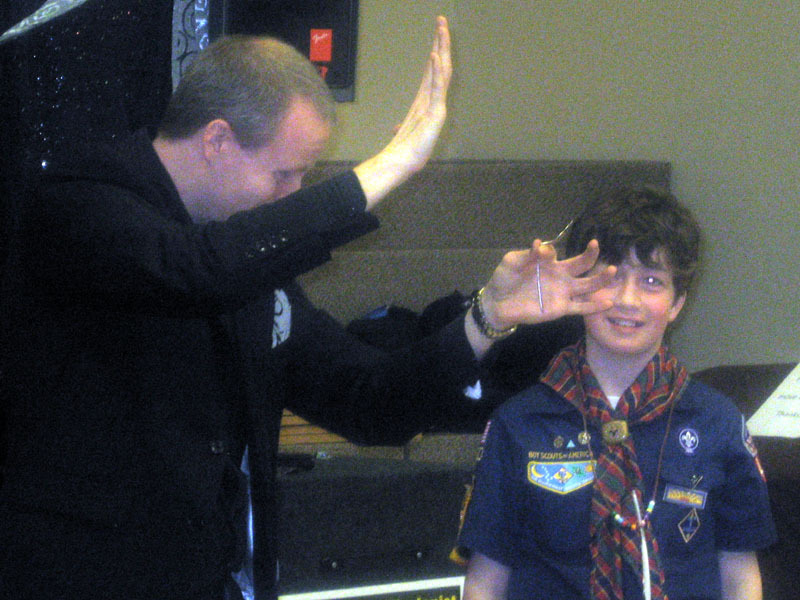 Allentown Magicians for Cub Scouts Blue and Gold Banquets! When it comes time to plan that upcoming scout meeting or banquet you really want to find some entertainment that will help make the event fun and memorable for everyone. Hiring Allentown magician Eddy Ray for your next cub scout blue and gold banquet will impress and amaze all of the scouts, including their friends and family! Magic has no boundaries and can be enjoyed by young and old. During Eddy Ray’s Amazing Magic Show, the scouts will get plenty of opportunities to assist “on stage” and interact with him making for a really fun and memorable show. Eddy combines world class sleight of hand magic, visual illusions, comedy, and lots of audience participation that have entertain thousands of cub scouts at meetings and banquets all over Pennsylvania. The best thing about this Allentown magician for cub scouts is that he designs his show to fit in just about any venue and provides a professional sound system and backdrop to help add that extra magical touch to the banquet. Eddy Ray is a certified magician who specializes in entertainment that is both kid and adult friendly. You’ll only find wholesome family entertainment with Eddy Ray! For more information on this Allentown magicians cub scout banquet magic shows, please contact him right now. This entry was posted in Allentown Magicians News and tagged allentown kids magician, allentown magicians for scouts, cub scout magicians in allentown, magician for blue and gold banquets allentown, magicians allentown cub scouts, magicians in allentown for kids on August 18, 2010 by admin.